Thirty masterpieces by this recently rediscovered female painter have been brought together for the first time. The collection shares a unique perspective on the her time and life story. She is an artist we study during my Art and History of Renaissance Italy classes. A woman apart; strong, defiant, driven and immensely talented. Not only was it unusual for a woman to be recognized as worthy of note during the Renaissance, this particular artist took on the male establishment of Rome and won. Her father, Orazio Gentileschi, was a painter of note in Rome. Agostino Tassi was one of Orazio’s compatriots, along with Caravaggio. In the course of their close artistic associations, Tassi raped Artemisia. Not one to shy from the wrong done her, she charged Tassi with sexual assault. After seven long and difficult months, Artemisia won her case. The emotional toll on her was deep. Following the resolution of the case, I believe that some of her work exhibits a visual retaliation for Tassi’s attack. There are three known self portraits of Artemisia. The one above was completed shortly after her marriage to a Florentine painter, Peter Antonio Stiattesi. I have wondered if the shape of her fingers, particularly those on the left hand, show the effect of sibille. These were a torture device used during the case against Tassi; metal rings were placed around her fingers and increasingly tightened during court proceedings to encourage truth in testimony. A Florentine by birth, Stiattesi and his bride moved to Florence where she worked for a number of years, most notably commissioned by Grand Duke Cosimo II. 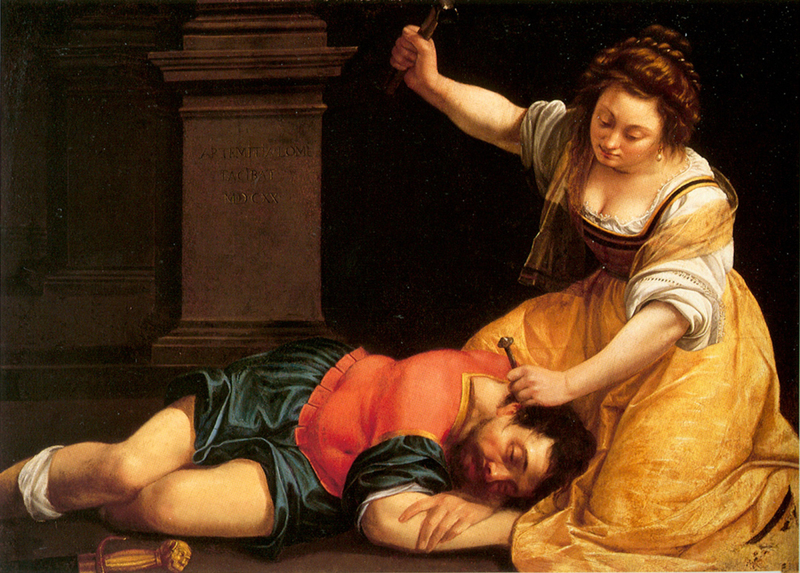 The biblical story of Judith taking the life of the Assyrian general Holofernes, in particular, was a subject of her intense interest. She completed two works about this strong woman; Judith Beheading Holofernes (1612-Called “The Naples“) and Judith Slaying Holofernes (1620). The paintings depict the biblical story of Judith who, after secreting herself and her maidservant into the enemy camp, tempts the Assyrian King Holofernes with sexual favors, gets him drunk and then beheads him. Judith returns with the severed head of the king and the Jewish forces win the day. Dark? Absolutely. Emotional? Clearly. I visualize Artemisia in her studio venting every ounce of her anger at her male dominated society on these canvases. Muscle tension, the force of the sword, the intensity of both Judith’s and her handmaiden’s faces during the brutal act all communicate anger, control, focus and approaching victory. The breadth and scope of Artemisia’s work goes well beyond these two masterpieces. Over thirty canvases grace this incredible exhibit at the Braschi in Rome. When you are next in Rome, and before the conclusion of the exhibit on May 7,2017, please take time to visit and study the work of an immensely talented artist.